Low Sodium Recipes & MORE. When I was in grad school, my breakfast of champions was a big bottle of Coke and a hot-from-the-oven soft pretzel (or sometimes two). I cut the caffeine out of the equation after graduation, but not the pretzels. I still take my kids down to South Philly early some mornings to buy pretzels fresh from the factory. Since I can’t eat the heavily salted commercial kind anymore, I came up with my own. These are still mighty tasty, especially with a squirt of spicy no-salt-added mustard. Measure yeast into a large mixing bowl. Add water, then honey and flour, and stir to combine. Turn dough out onto clean surface and knead 5 minutes. Cut dough into 10 equal pieces. Roll each piece into a long snake-like tube, then twist to form a pretzel (feel free to be creative). 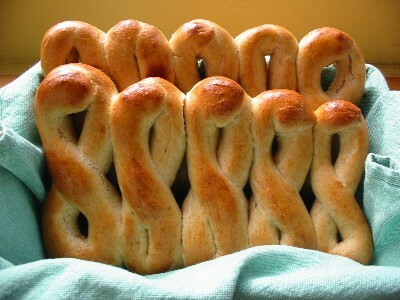 Place pretzels onto ungreased baking sheet(s) and brush lightly with the beaten egg. Place sheet(s) on middle rack in oven and bake about 15 minutes, until golden brown. Remove from oven and gently remove from baking sheets. Enjoy warm or cool. **NOTE: Additional nutritional information provided below – many thanks to Kelly and recipespark.com! This entry was posted in Bread, Snacks, Treats. Bookmark the permalink. How is it 9.5mg sodium per pretzel if all the ingredients going into it have none? Where can you get salt free mustard? Low salt eating is new for me and I am trying to find low salt replacements. Your recipe sounds easy. Looking over all your recipes and all look anazing!!!! My husband nearly had a stroke due to high blood pressure right before the holidays. I know it had to take a lot of research and hard work for you to out something like this together. Thank you for sharing as we will be trying quite a few of your recipes in the very near future. I will post puctures of the dishes we try. LOVE THE DAILY DISH? SAY THANKS WITH A GIFT! Like The Daily Dish on Facebook! VALUE THIS SITE? SHOW YOUR SUPPORT!